Although the climate of the Ukraine was much colder than today towards the end of the last glacial maximum, with so much water trapped in the ice caps, there would have been far less snow than one would otherwise expect. The reindeer herds, musk ox and the other large mammals of the tundra-steppe, such as mammoth and the woolly rhinoceros, would have provided much of the meat required by the people occupying these regions during the late Upper Palaeolithic. They also used the skeletal remains of the bigger animals to construct their dwellings that were often sited on the southern facing slopes of the river valleys. The microclimates provided by these more sheltered locations supported a woodland habitat where nuts, berries and other fruit could be found, as well as edible fungi, roots and the rhizomes of water plants. There would have also been fish, waterfowl and small mammals that could be trapped for food. 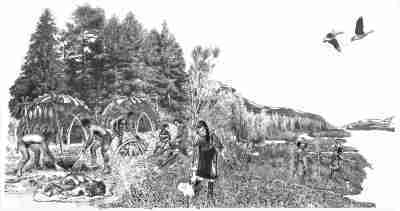 Even here though, in such a cold climate, permafrost meant that the subsoil was frozen throughout the year and storage pits dug in the frozen earth, acted as a deep freeze that allowed the people to cache food that could be preserved until it was required.